Flywheel and Handwheel are provided. Friction plate is provided on cam plate to minimize wear & tear of cam track which also facilitates its easy replacement. Separate Centre Pillar of C.I. Graded Casting. Turret of C.I. Graded Casting. 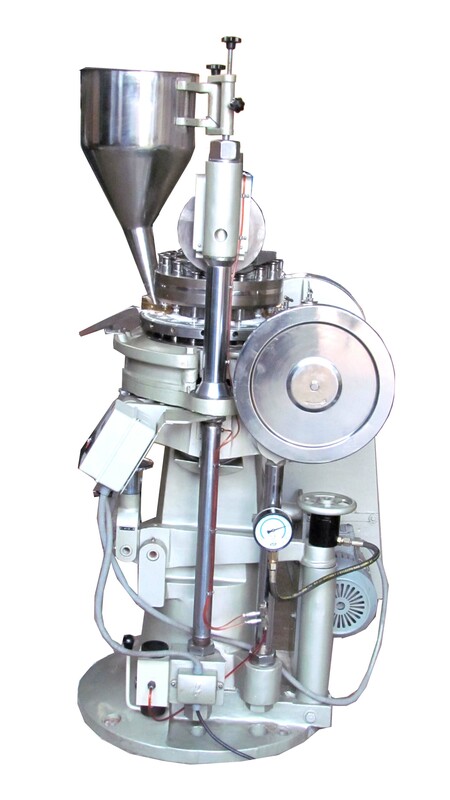 Very rigid Gun-metal Feed frame with sufficient height to avoid spill over of powder. All Columns and Nuts are electroplated. Central Oil Lubrication system with hand pump. Pressure gauge provided to check compression load. 11.Oil groove on top face of turret for collection of excess oil. wear resistance and long life. 14. Worm is made up of Phosphor Bronze. 15. RDD3-23 station machine can compress D.S. tablet upto 16mm (5/8”) in length. 16.Turret with Key slots essential for shaped tooling. 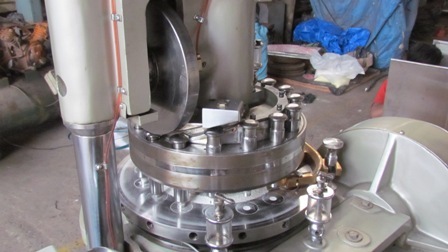 17.Maximum Turret RPM for STD Machine is 30. 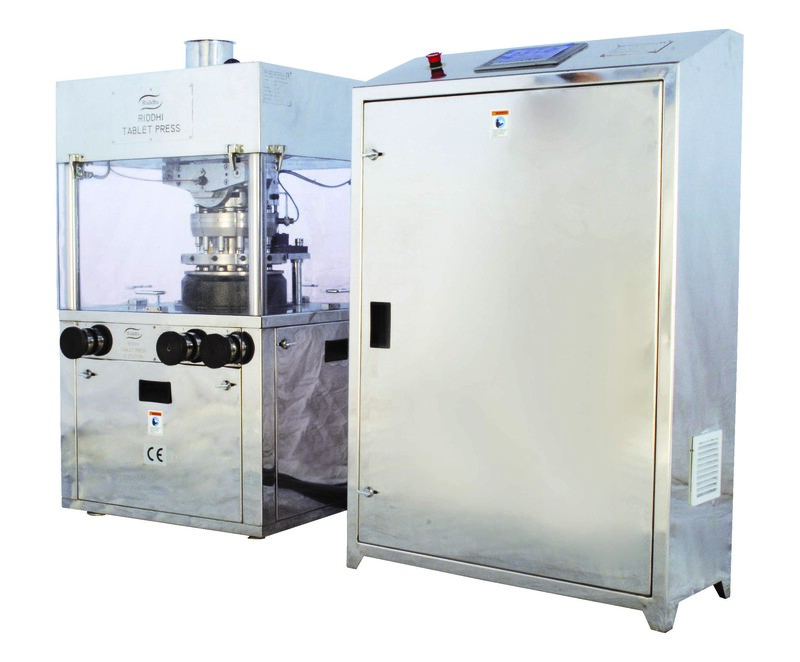 Machine is totally enclosed, i.e. Top half of the machine Compression zone) with S. S hood & acrylic covers and Lower half of the machine complete with Mat finished S.S. covers. This reduces the noise level and to & fro flow of dust between compression zone and compression room. Anti vibration mounting pads are provided, hence no foundation is required. Large paint free compression zone with plenty of space for ease of cleaning & Accessibility of components. Electronic Counter showing total output is provided on the control panel. Operating system same as standard machine and it is easy to operate and maintain the machine. Most of the components are common with the standard machine which reduces inventory of spares. Higher Turret speed upto 42 RPM gives higher output than standard machine. 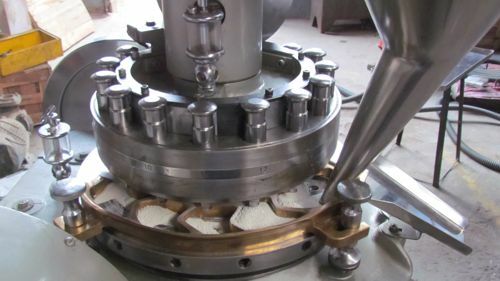 Maximum Turret RPM for GMP Machine is 42. Electncals 2HP. 3 .A C. 2HP. 3 .A C. 2HP. 3 .A C.